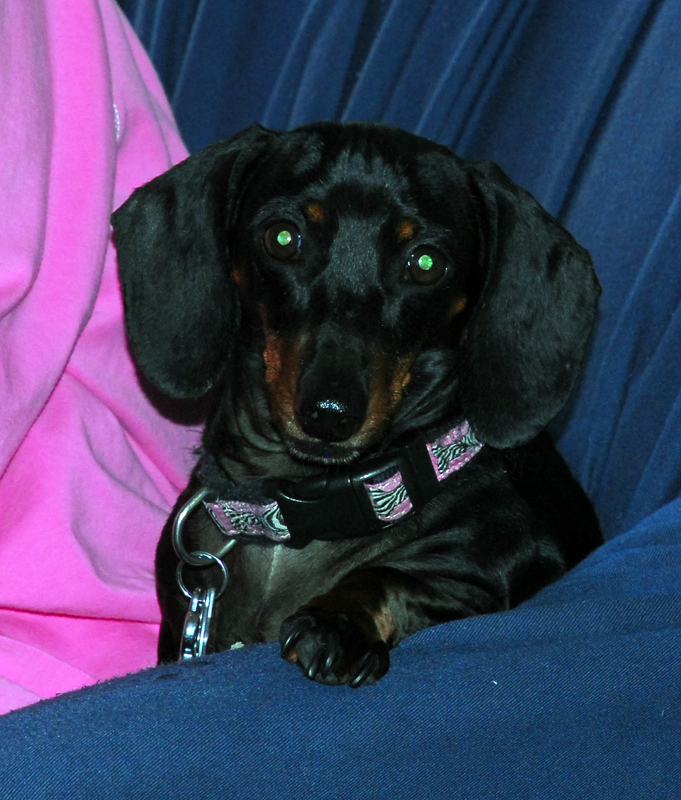 Weekend with the Dachsies With Moxie! 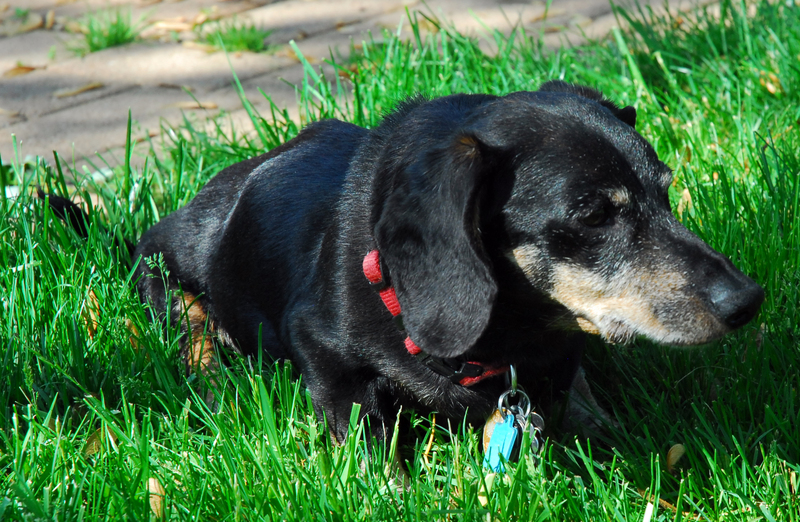 A couple of weeks ago I set out from my home to Cleveland, Ohio to attend a two day Anita Goodesign seminar, but the main reason I was heading out there was to meet Agnes, Geoff, and the Dachsies With Moxie. You all know how fun it is to strike up a friendship among fellow bloggers, but seldom do we actually get to meet in the flesh and fur. 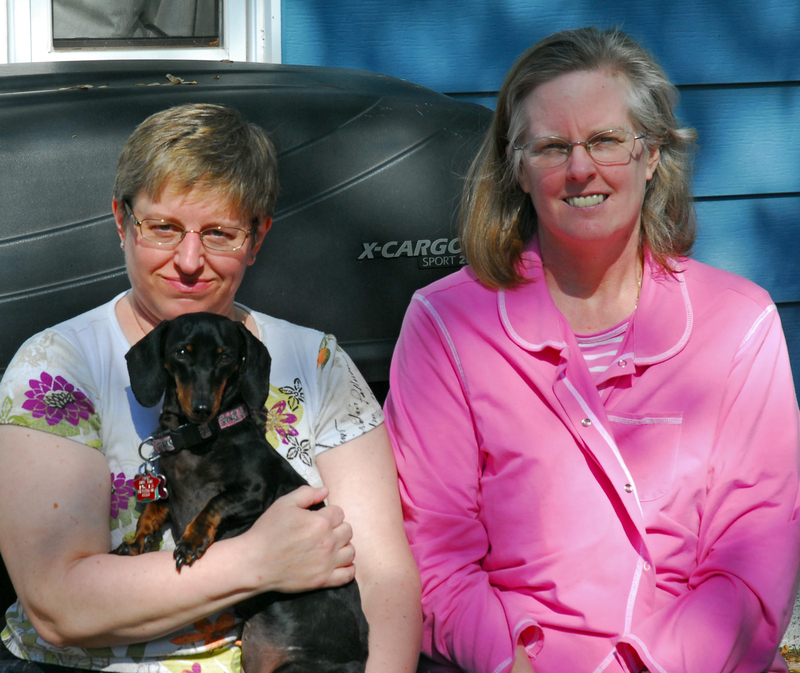 Agnes and I bonded over the making of the Fearless Five Quilt so I jumped at the chance to meet her when she invited me to stay at her home while attending the seminar. 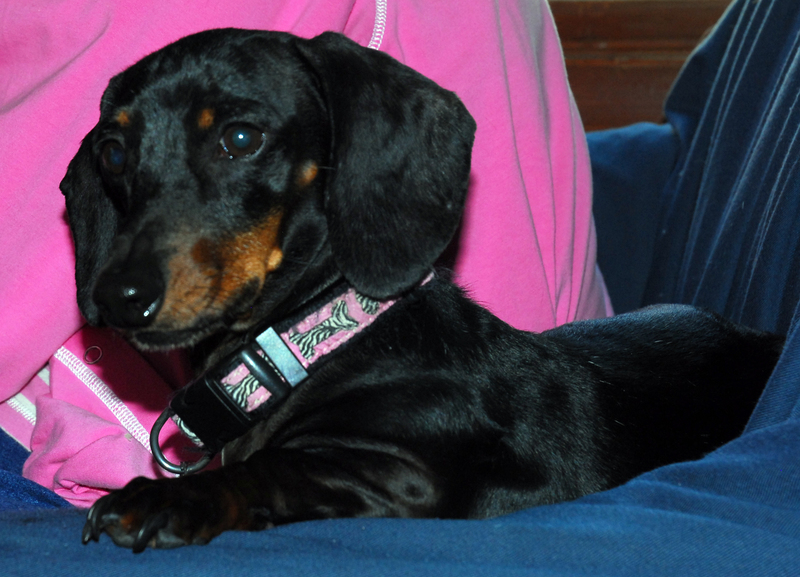 I have to say that the Dachsies with Moxie did not disappoint and I soon fell in love with one of the gang. Sweet Tasha quickly wiggled her way into my heart. She is a real snuggler and loves to give kisses. Since Agnes and I were gone all day Thursday and Friday I didn’t get as much time to spend with all of the gang as I would have liked, but they are all so adorable. I can see why Max (da odder weenie) has fallen head over heals for beautiful Miss Anna Rose. I love her long locks and beautiful dappled coloring. It took Anna Rose a bit longer to warm up to me, but according to Agnes I am the first overnight guest they have had since she joined the flock so having someone other than her mom or dad prowling around the house was a bit startling for her at first. Mr. Chip is the guardian of the home, besides Mr. Geoff of course. He was always the first to let us know if someone was walking down the street and to be sure we checked it out. The sweet old man of the bunch is the Thai Master. Because of his infirmities he doesn’t move around with ease, but if he gets it into his head that he wants to get somewhere there is no stopping him. The second night I was staying with the Bullock clan there was an “incident” that occurred while we adults were dining out. When we got home I discovered there had been a break in and some snacks I had packed for my drive had been removed from my tote bag and were now on the floor. 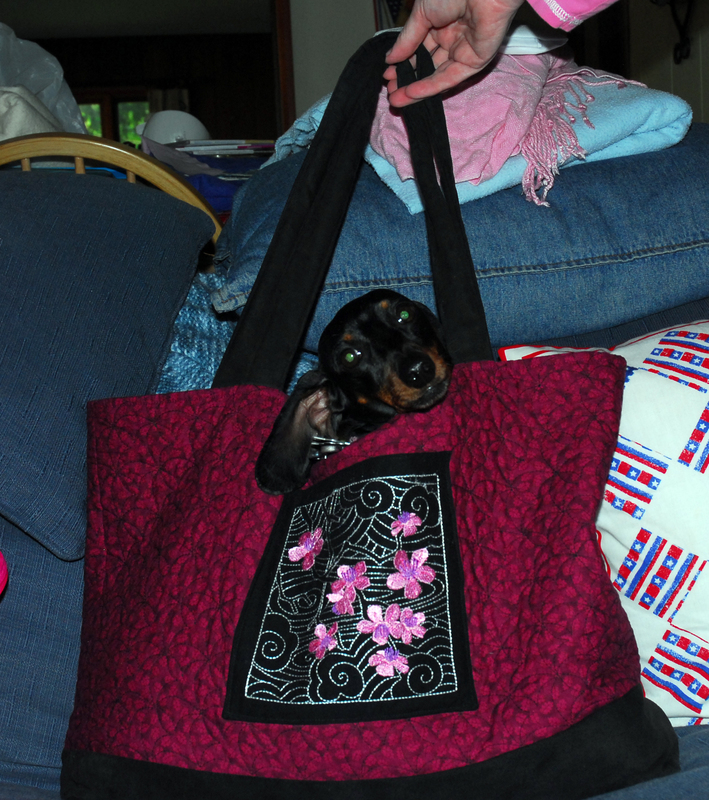 I guess I didn’t realize that mini-dachsies could jump as high to get up on the bed where the tote bag was stored. Needles to say the treats were stored in a secure container after that. Later that evening as I was chatting with my husband and lying on the guest bed I discovered that someone had left me a “gift” on the bed. 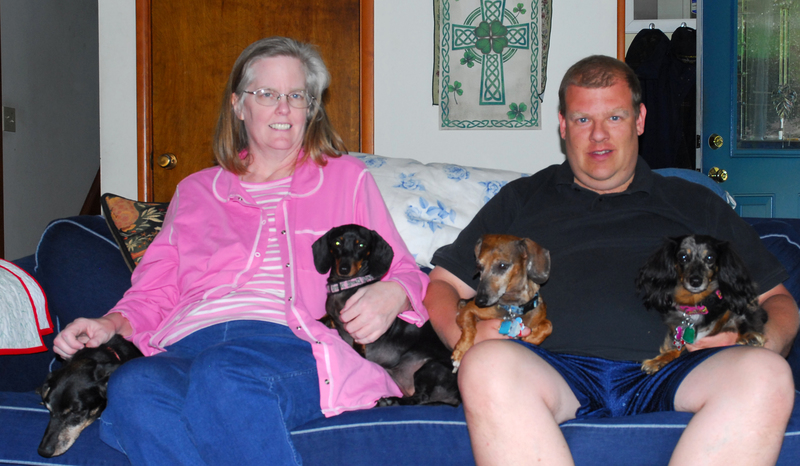 According to Agnes and Geoff only two of the four dogs can do stairs, Tasha and Chip. The bedding was swiftly removed, thrown into the wash and was clean before bed time. It certainly wasn’t the first time a dog peed on my bed. I find it difficult to believe that my sweet BFF Tasha would do such a thing, but before we left for dinner Tasha and I were having a very nice belly rubbing session. Maybe she was upset that I stopped and then left for a couple of hours. One of the amazing sights at the Bullock home is Mr. Geoff’s trains. Here is just one picture of the huge train set up he has. You should click on it to make it bigger for the full effect. This shows only a quarter of the entire set up. There are lots of cool sound effects, lights and even two different types of draw bridges. After two days of seminars it was time to pack up and head home. I tried to get out of the house with Tasha packed in my tote bag, but Agnes and Geoff gave all my bags a pat down and found her before I could get her to the car 😀 . After one last snuggle with my BFF it was time to say farewell to the Bullock gang. I have a feeling this won’t be the last time we see each other. Thanks to all the Bullocks for the hospitality (well except for that one incident) and friendship. I had a great time. That was a great visit for you. 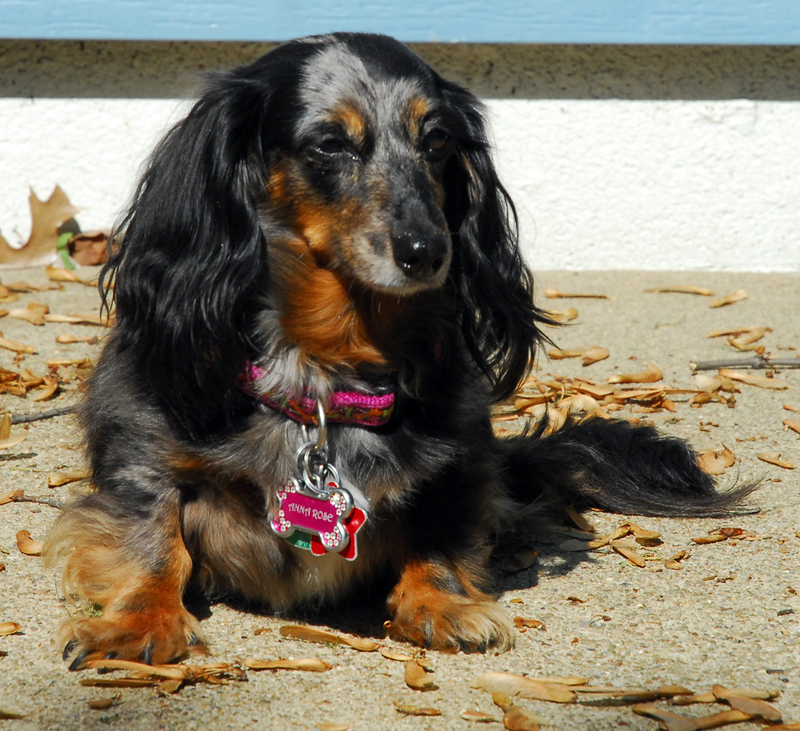 We don’t the Dachsies with Moxie very well, but they sure are gorgeous pups. that train display is really impressive. Mom would love to have the time and place to do that too. How wonderful that you got to spend time with them and that you all hit it off so well! Hope you have many more weekends together. Sure you had a great time with them! What a fun stay! I hope you do get a chance to get together again soon! I’d probably try to steal Tasha, too! That sounds like a fabulous time. I hope you get to do it again soon. OH MY DOGS you must have been in heaven what a weekend. Attending a special event, meeting new friends in person and falling in love all in one weekend. We love the treat caper and oh well what is a little accident among friends. Great pictures for a memorable weekend. 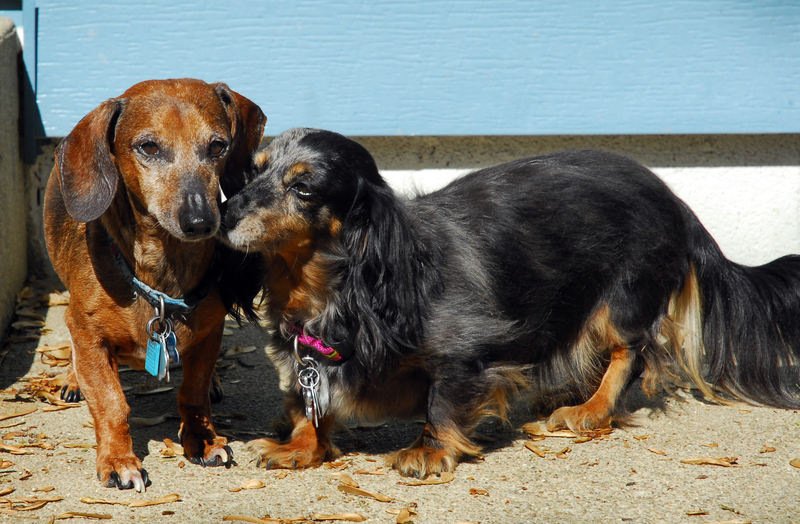 Those doxies are SO cute!! What wonderful hosts! I’m so glad to hear that everyone had an awesome time together. 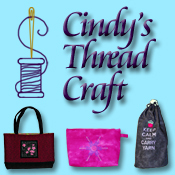 Mom says this is one of the coolest parts about blogging!